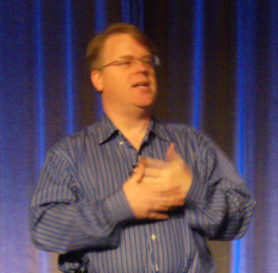 I’m blogging from the front row of Bulldog Reporter’s Media Relations 2008 Summit, as Robert Scoble begins his keynote. I like how Robert starts his presentations by gauging the experience of the audience, so he can speak at a level that will be meaningful to them. Robert says Web 3.0 is “the death of the page.” An example is Twittervision. He’s giving the group (more than half of whom haven’t been in Twitter) a tour of his life. Most of them haven’t seen FriendFeed either. Robert is on 20 different services in what he calls “the social media starfish” and Friendfeed brings them together. Here is his FriendFeed and here is mine. Robert is using Sliderocket for his presentation, which is an online version of Powerpoint. It allows collaborative editing. It’s like a wiki for presentations. Scoble uses Google Reader for reading his RSS feeds to create “a river of news.” Techmeme tells him the big stories. The thing that just changed in Google Reader a few months ago is the addition of friends, which lets people share news. He talked about “the friend divide” which means that people who are new to a service aren’t going to get as much value out of it because they don’t have a lot of friends yet. The solution: Get friends. Upcoming.org is another site for seeing what is…you guessed it…upcoming. Robert closed with a demonstration of Qik, which live streams video from his cell phone. It’s a TV station in your pocket. The minute he turns off his cell phone it becomes a recorded archive on the Qik site. It only works with Nokia phones right now, I think. Robert’s take-away: The word-of-mouth network is hyper-efficient. Even in the 1980s when he worked at a camera store, 80 percent of his sales came from word-of-mouth. With the web today, it’s a world-wide network for word-of-mouth. That’s what I’ll be talking about at my presentation. Go to the Bulldog Media Relations group to see more of the pictures from Robert’s presentation.